On this first Sunday in the new liturgical year, Jesus warns His followers to “stay awake!” Why do we need to hear this today? St. Matthew records for us an extended conversation Jesus had with His disciples about “the coming of the Son of Man.” We know this prophecy had two levels of meaning. Jesus was preparing His followers for the day of judgment that was to come on Jerusalem, when God would judge her rejection of the Messiah. The catastrophic sack of the city in 70 A.D. by the Romans, in which the Temple of the Old Covenant was destroyed (never to be rebuilt), was the first fulfillment of His warning. How was that a “coming of the Son of Man”? The destruction of the Temple meant the end of all animal sacrifices for Israel. Never again would animal flesh and blood be offered to God to atone for sin. Instead, because Jesus ascended into heaven in a cloud, He sits at God’s right hand eternally offering Himself for our sin. He makes present forever the one sacrifice He made on the Cross. His Presence makes full atonement for man’s rebellion against God. The destruction of the Temple was the definitive physical, visible sign of the end of the Old Covenant; it gave way to its fulfillment in the New Covenant. The Son of Man has now come to earth in His Church. He, together with all believers, is now the new Temple of God. “The coming of the Son of Man” also refers to His promised return to this earth, when He will make a definitive end to the evil that has haunted us since the Garden of Eden. This coming will also bring judgment on that evil and all who willingly gave themselves to it. For both the destruction of Jerusalem and the Second Coming, the essence of Jesus’ warning is a call to “stay awake!” Why is wakefulness so important to Him? Jesus says that “the coming of the Son of Man” can be compared to the event of the Flood in Noah’s time, God’s first judgment on earth. People were “eating and drinking, marrying and giving in marriage up to the day that Noah entered the ark.” In other words, they did not realize the trouble that lay ahead for them. In Gn 6:5, we see that at that time, “the wickedness of man was great in the earth, and that every imagination of the thoughts of his heart was only evil continually.” Yet these people had no fear of God. They did not sense that anything was wrong; they were asleep to that. They carried on the ordinary events of human life as if they didn’t have a care in the world. We might wonder what Noah’s neighbors thought about his building project. When they saw him building an enormous boat on dry land, did they laugh and mock him? Were they at all curious about the reason for the boat? Its very presence should have been a sign to them that something was coming. However, on the day Noah and his family entered the ark, we don’t see any crowds around them begging to be allowed on. Only the animals followed Noah. Jesus wanted the Jews of His day to “stay awake” and watch for the signs of impending destruction. In their case, He wanted His followers, all of them Jews, to flee their beloved Jerusalem and not try to defend their treasured Temple (see Mt 24:16). He wanted His Church to survive the catastrophe and live on to spread the Gospel to the ends of the earth. In our case, as the parables in St. Matthew’s Gospel that follow our reading make clear, Jesus wants us to “stay awake” in order to be good stewards of the Gospel, to grow in virtue, to remember that we, too, will one day need to give an accounting of the gift of life He has won for us. Do we need to hear this call to wakefulness? Our own time is full of the everyday business of life. There is the constant bustle of human activity that can, paradoxically, lull us into a sleep that forgets this life is not an end in itself. There is life in the Kingdom of God that is more real than this one, because it is eternal. It is the kingdom for which we long (and pray for in the Our Father). The Church, often compared to Noah’s ark by the Early Church Fathers, sits now on the dry land of this passing world. She is the ship of our salvation, and she is a sign of the life of the world to come. Advent is the season that calls us back to the expectation of that life and, most importantly, a preparation for it. Should we resolve today to ask for Jesus’ help in the weeks ahead to shake off the drowsiness of our self-absorption and listen afresh to His call to “stay awake”? Possible response: Lord Jesus, how ironic that Advent can be so busy I want to sleep just from tiredness. Help me slow down and stay awake to You. Jesus came to establish this kingdom. 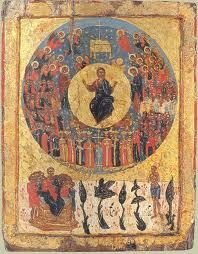 He rules now from heaven over His Church, the universal presence of His kingdom on earth. True peace in our lives starts now, when we receive the peace Jesus offers us (repeated so frequently in every Mass). Someday, His peace will manifestly rule everywhere. Possible response: Heavenly Father, a kingdom of peace sounds so good to me. Help me seek Your peace today and be its outpost in this restless world. St. Paul wrote to the Christians in Rome the same exhortation Jesus gave His disciples: “awake from sleep.” We can sense his urgency as he tells believers “our salvation is nearer now than when we first believed … the day is at hand.” St. Paul believed Jesus’ own urgent words about readiness for the day of the Lord. He lived, did his missionary work, and died before the first judgment, the fall of Jerusalem. He knew the timetable Jesus Himself had given: one generation (see Mt 24:34). We should expect to see this reality reflected in his writings. Because Jesus’ words have a double layer of meaning, we can be greatly helped by what St. Paul wrote to people who should live with expectation of the Lord’s “day”: “Let us then throw off the works of darkness and put on the armor of light.” What a bracing challenge to us as we begin our season of Advent today! St. Paul gives us concrete examples of behavior to “throw off”: sensual self-indulgence (orgies, drunkenness, promiscuity, lust) and selfish pride (rivalry, jealousy). He assures us that if we “put on the Lord Jesus Christ, and make no provisions for the desires of the flesh,” we will be ready for Him whenever He comes. Should we take St. Paul’s advice and resolve this Advent to conduct ourselves “properly as in the day”? Possible response: Lord Jesus, each day brings me temptations to petty works of darkness, such as impatience, irritation with others, laziness, etc. Help me seek Your light this Advent, one day at a time.